The type 2 deiodinase (D2) converts the pro-hormone T4 to the metabolically active molecule T3, but its global inactivation (GLOB-D2KO) unexpectedly lowers the respiratory exchange rate (RQ) and increases food intake. Here we used FloxD2 mice to generate systemically euthyroid FAT-specific (Fabp4-Cre), ASTROCYTE-specific (GFAP-Cre) or SKELETAL MUSCLE-specific (MLC-Cre) D2KO mice that were monitored continuously. The ASTRO-D2KO mice also exhibited lower diurnal RQ and greater contribution of fatty acid oxidation to EE, but no differences in food intake were observed. 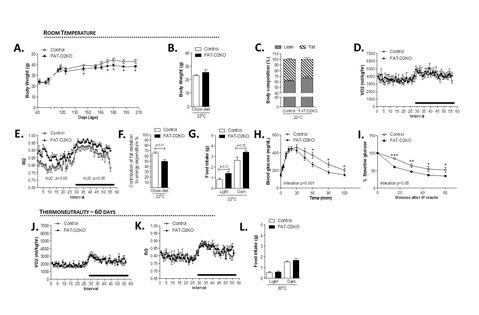 In contrast, the FAT-D2KO mouse exhibited sustained (24 h) increase in RQ values, increased food intake, tolerance to glucose and sensitivity to insulin, all supporting greater contribution of carbohydrate oxidation to EE. Furthermore, FAT-D2KO animals that were kept on a high-fat diet for 8 weeks gained more body weight and fat, indicating impaired brown adipose tissue (BAT) thermogenesis and/or inability to oxidize the fat excess. Acclimatization of FAT-D2KO mice at thermoneutrality dissipated both features of this phenotype. Muscle D2 does not seem to play a significant metabolic role given that SKM-D2KO animals exhibited no phenotype. The present findings are unique in that they were obtained in systemically euthyroid animals, revealing that brain D2 plays a dominant albeit indirect role in fatty acid oxidation via its sympathetic control of BAT activity. D2-generated T3 in BAT accelerates fatty acid oxidation and protects against diet-induced obesity. Tissue-specific inactivation of type II deiodinase reveals multi-level control of fatty acid oxidation by thyroid hormone in the mouse.